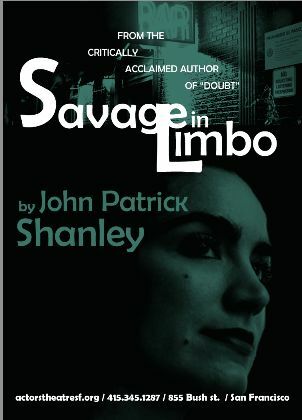 “Savage In Limbo” by John Patrick Shanley, presented by Actor’s Theatre of San Francisco. Director: Carole Robinson. Assistant Director: Kevin Daniels. Creative Consultant: Christian Phillips. Production Coordinator: Monique Flambures. Stage Managers: Monique Flambures, Kevin Daniels. Set Design: Biz Duncan. Light Design: Rachel Klyce. Sound Design: James Baldock. Technicians: James Baldock and Merri Gordon. Properties: The ATSF Ensemble. Murk: Sean Hallinan. April White: Tiffany Mitchell. Denise Savage: Larissa Archer. Linda Routunda: Jessica Lea Risco. Tony Aronica: Paul Rodriguez. John Patrick Shanley won a well-deserved academy award for his 1988 screenplay for “Moonstruck” and, in 2005, scored big with the brilliant “Doubt: A Parable” which won an Obie, a Drama Desk Award, a Tony and a Pulitzer. The film which followed in 2008 received a Golden Globe nomination for best screenplay and featured multiple academy-award nominated performances. Before these successes, Shanley wrote a number of apprentice works which showed promise but were not in the same league of excellence. 1984’s “Savage In Limbo” is a script from that category. With “Savage In Limbo” the concert is presented as a series of largely unconnected monologues by a group of casually acquainted drinkers in a dive bar. Essentially, what we have here is a set of arias for actors, without a strongly engaging story line or dramatic interest. These arias, however, are written by a playwright of unusual talent and they serve well as acting showcases. The result is that as an evening of story telling, the piece does not succeed. But as a set of showcase performances by a group of skilled actors, it is very impressive. Each of the actors under Carole Robinson’s straightforward direction deliver striking performances. Larissa Archer‘s Denise Savage is a study in manipulative frustration. Paul Rodriguez and Jessica Lea Risco as the bickering Tony and Linda hit multiple emotional bullseyes and Sean Hallinan is more than fine as the taciturn and unfriendly bartender, Murk. The standout work in this production, however, is delivered by Tiffany Mitchell whose characterization of April White is simply extraordinary. Her every gesture, glance and speech suggests a wealth of inner life that seems bottomless. Watch the way she relates to the bar on which she leans, the glass from which she drinks, her clothing, the paper weight gift she receives—every detail of her physical world is used to effectively reveal character. When I was an acting student in the 1980s, a popular textbook in acting classes was Uta Hagen‘s “Respect For Acting”. Ms. Mitchell’s kind of acting was the sort for which Ms. Hagen was rightly demanding respect. It is a memorable performance that deserves to be recognized when award season comes around. “Savage In Limbo” seems an unusual choice for the Actor’s Theatre of San Francisco, which specializes in ensemble pieces, which this is not. It does provide ample opportunity, however, for the company to showcase their expertise in the kind of acting that focusses on a deeply realized inner life and with Ms. Mitchell’s performance they have a gem of an example. Posted in Reviews.Tagged Actors' Theatre of San Francisco, Biz Duncan, Carole Robinson, Charles Kruger, Christian Phillips, James Baldock, Jessica Lea Risco, John Patrick Shanley, Kevin Daniels, Larissa Archer, Merri Gordon, Monique Flambures, Paul Rodriguez, Rachel Klyce, San Francisco Theatre Reviews, Savage In Limbo, Sean Hallinan, Tiffany Mitchell.